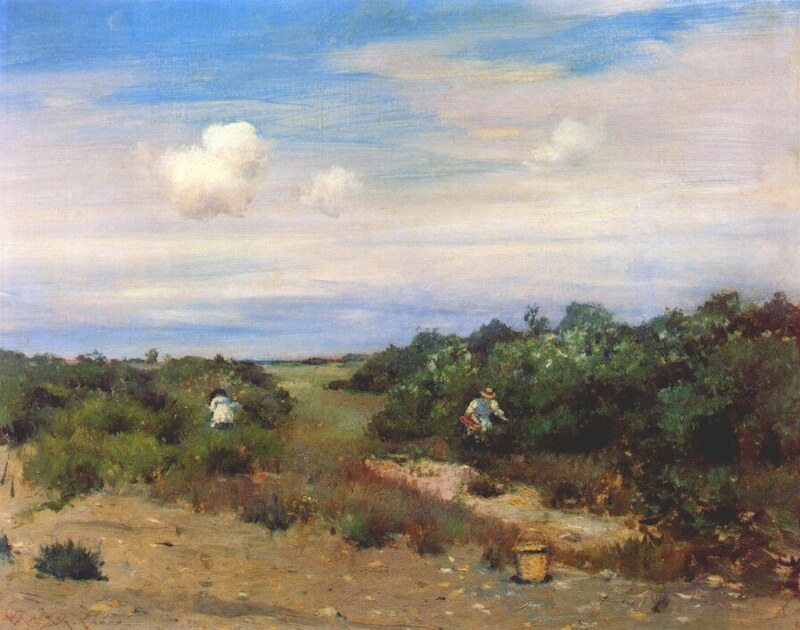 In 1891, plein air painting, particularly in oils, was a relatively new technique in the US, and growing rapidly in popularity. 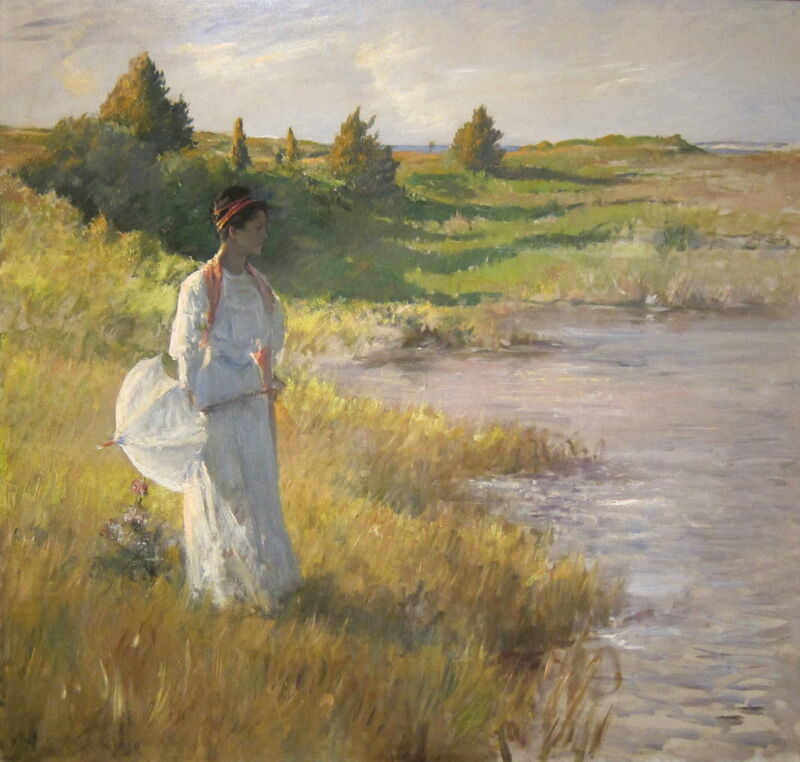 It was Janet Hoyt who first invited William Merritt Chase (1849–1916) to come to the new art village in western Southampton, Long Island, to teach the hundreds of students attending her new plein air art school. This was to be the start of a new chapter in his teaching, his art, and for his family. By the following summer, his friend Stanford White had designed and built him a summer house at Shinnecock, with an integral studio. 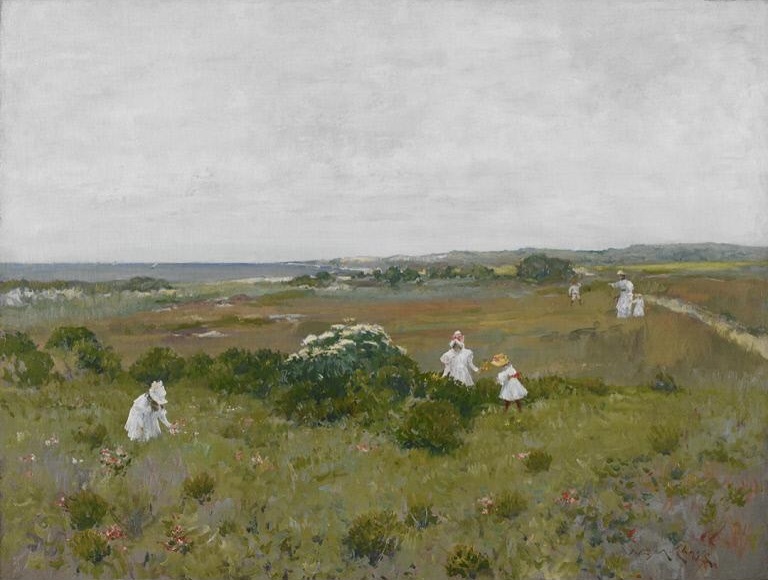 The Chase family moved out of New York at the start of the summer, and while father was busy teaching the hundreds of students, his wife and children were able to enjoy the surrounding almost untouched countryside, the beaches, and a different pace of life. 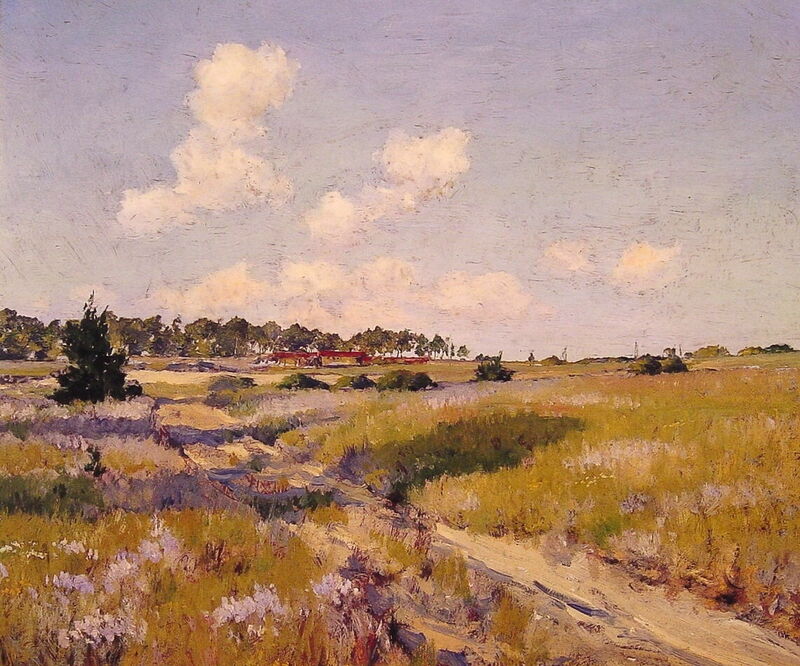 Chase continued to teach for twelve consecutive summers at Shinnecock, his skills and experience being shared with thousands of aspiring painters. 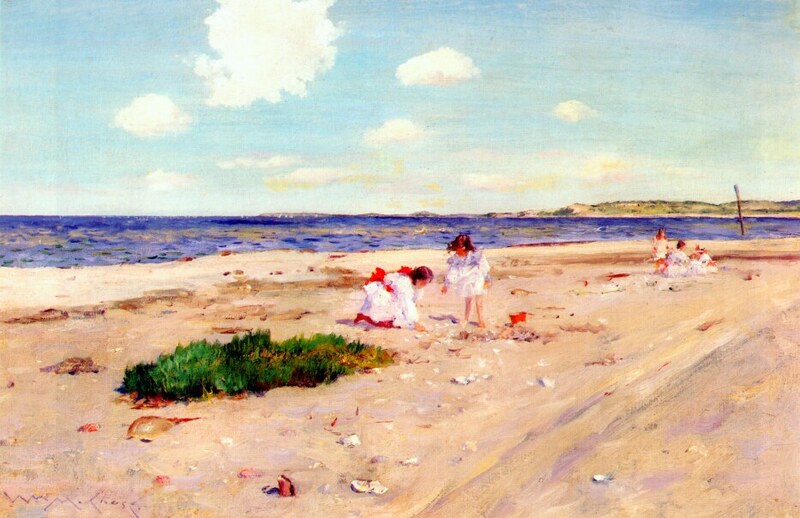 In later years, when he was drawn back to Europe, and Florence in particular, his family continued to grow up in the sunny Long Island summers. 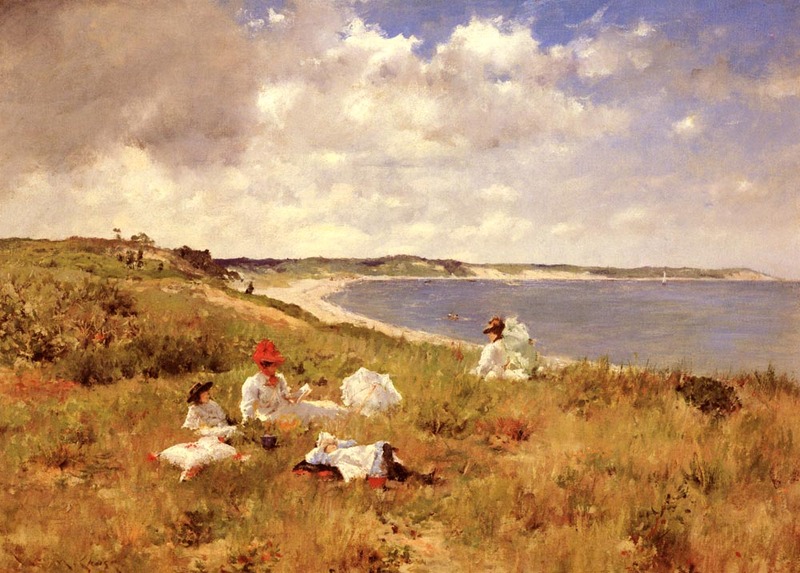 Although as we have seen Chase was a masterly painter of portraits and other genres, his Impressionist style was at its strongest when he was sketching outdoors in oils at Shinnecock. 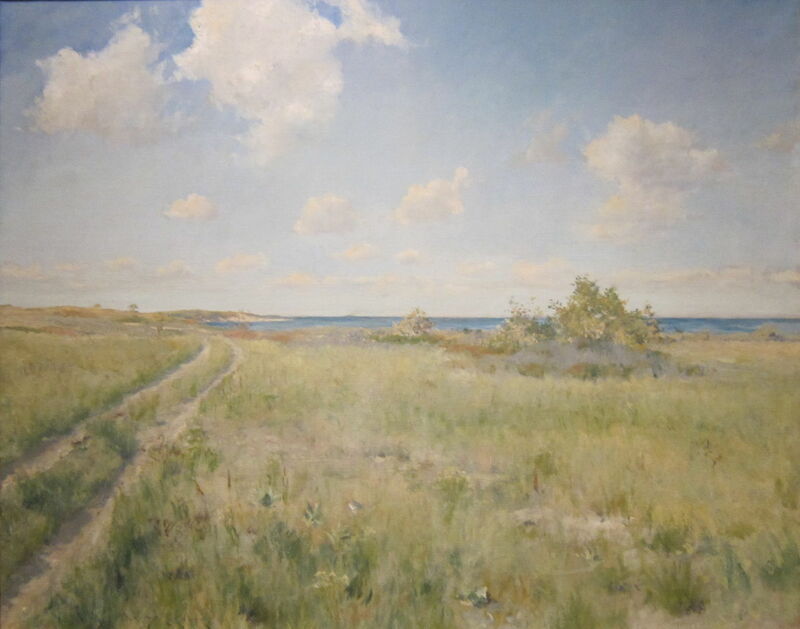 There is little point in trying to elaborate or explain his paintings in words: they show the skies, rough scrub, the Chase house, beaches, old tracks, and of course his wife and children. I have arranged them in approximate chronological order, but otherwise I will leave it to his paintings to show you Chase’s favourite Shinnecock. 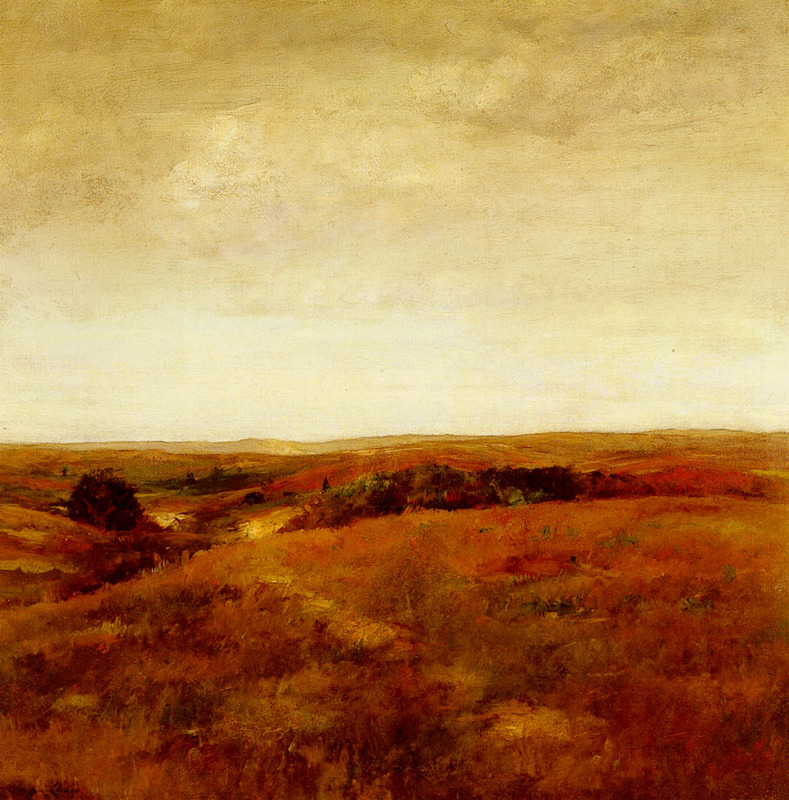 William Merritt Chase (1849–1916), Shinnecock Hills (A View of Shinnecock) (1891), oil on panel, 45.4 x 61 cm, Wadsworth Atheneum, Hartford, CT. Wikimedia Commons. 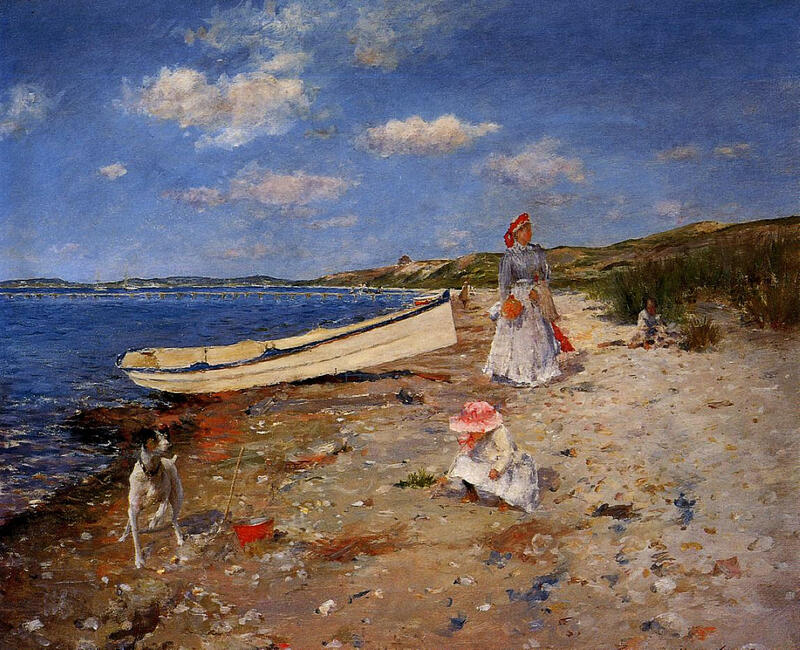 William Merritt Chase (1849–1916), Shell Beach at Shinnecock (c 1892), further details not known. Wikimedia Commons. 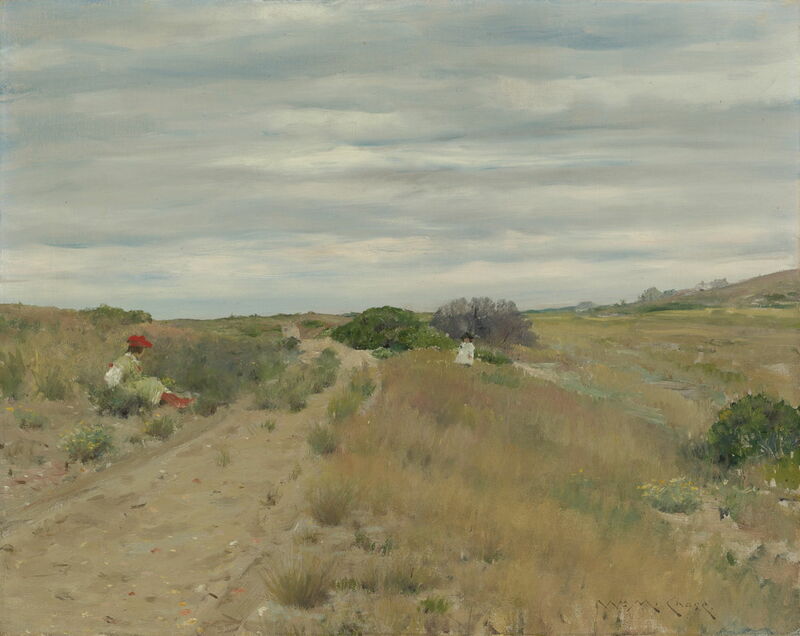 William Merritt Chase (1849–1916), The Old Road to the Sea (1893), oil on canvas, dimensions not known, Cleveland Museum of Art, Cleveland, OH. By Wmpearl, via Wikimedia Commons. 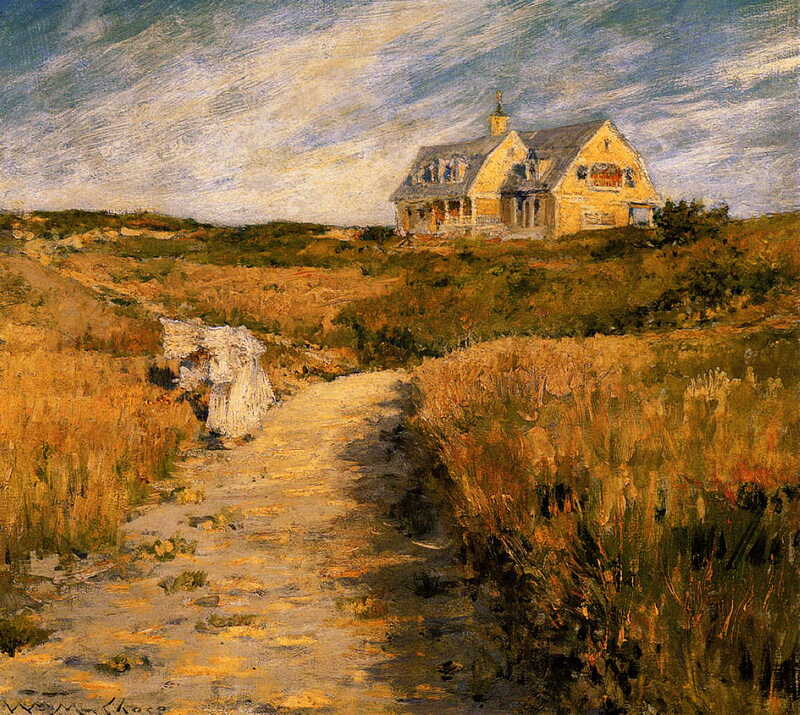 William Merritt Chase (1849–1916), October (c 1893), oil on canvas, 101.6 x 101.6 cm, Private collection. Wikimedia Commons. 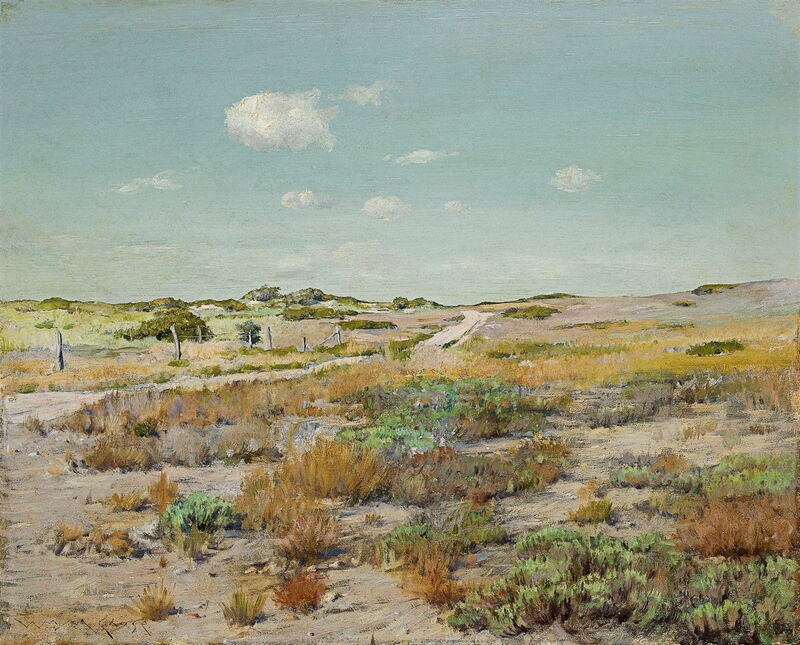 William Merritt Chase (1849–1916), The Old Sand Road (c 1894), oil on canvas, 41.9 × 51.4 cm, Private collection. Wikimedia Commons. 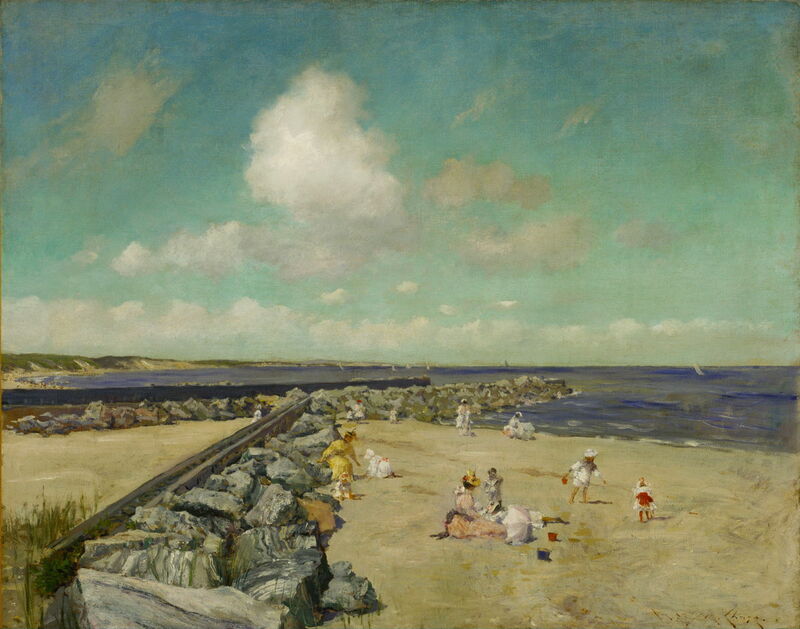 William Merritt Chase (1849–1916), Near the Beach, Shinnecock (c 1895), oil on canvas, 76.1 × 122.3 cm, Toledo Museum of Art, Toledo, OH. Wikimedia Commons. 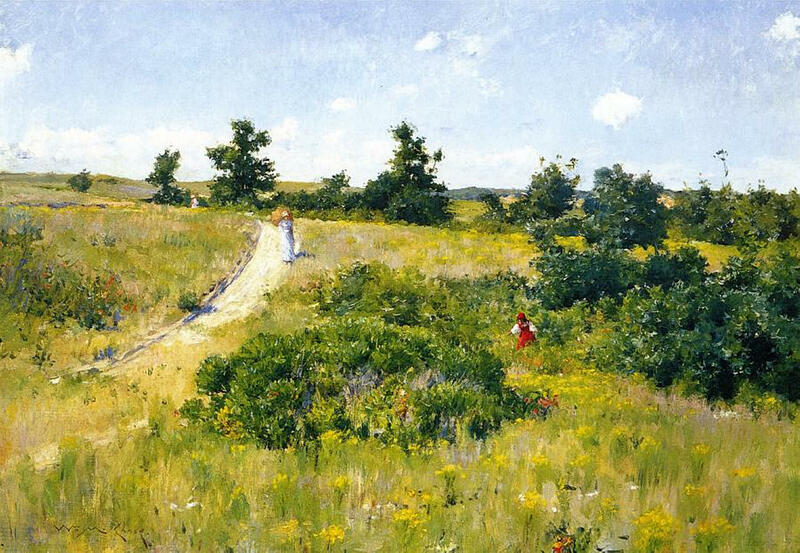 William Merritt Chase (1849–1916), An Afternoon Stroll (c 1895), oil on canvas, dimensions not known, San Diego Museum of Art, San Diego, CA. By Wmpearl, via Wikimedia Commons. 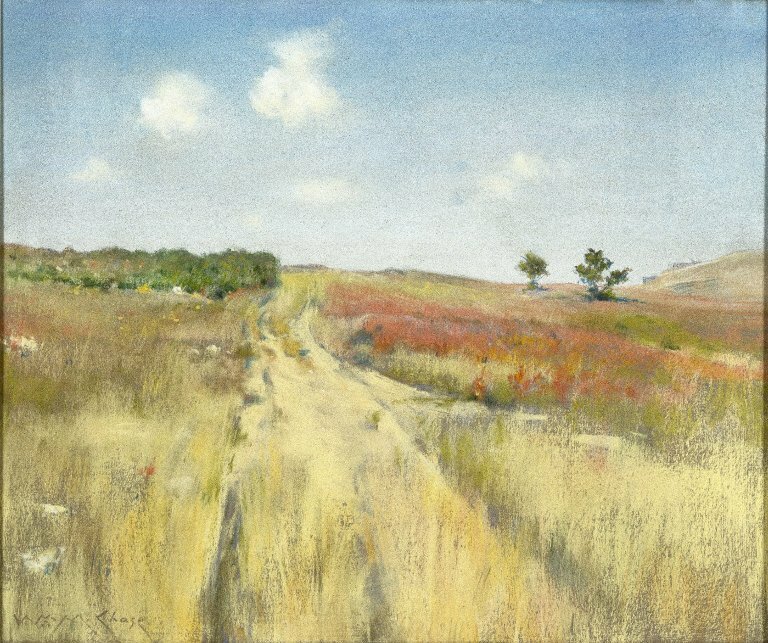 William Merritt Chase (1849–1916), Shinnecock Hills (1893-1897), oil on panel, 44.4 × 54.6 cm, Thyssen-Bornemisza Museum, Madrid. Wikimedia Commons. 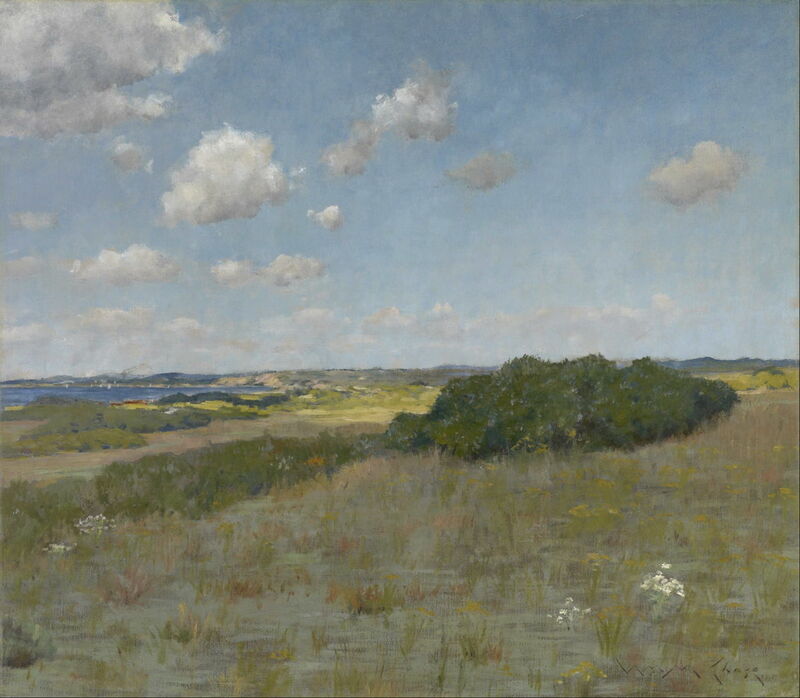 William Merritt Chase (1849–1916), Shinnecock Hills (c 1895), oil on canvas, 50.8 × 61 cm, Brooklyn Museum, New York, NY. Wikimedia Commons. 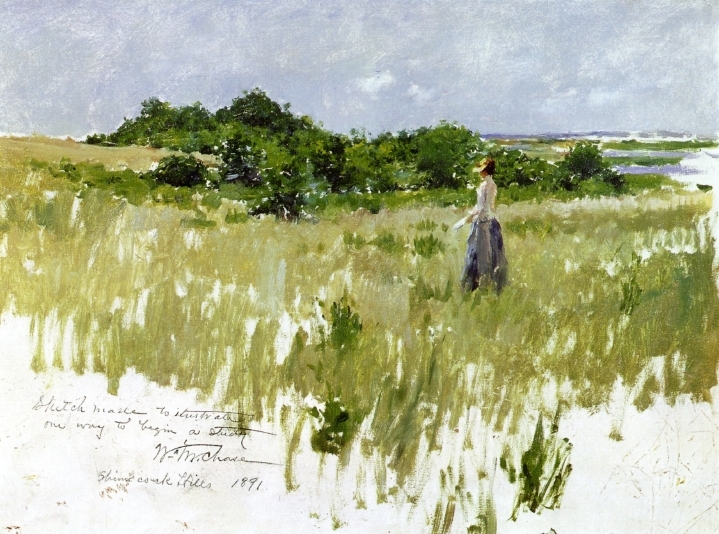 William Merritt Chase (1849–1916), Shinnecock Hills, Long Island (c 1895), further details not known. Wikimedia Commons. 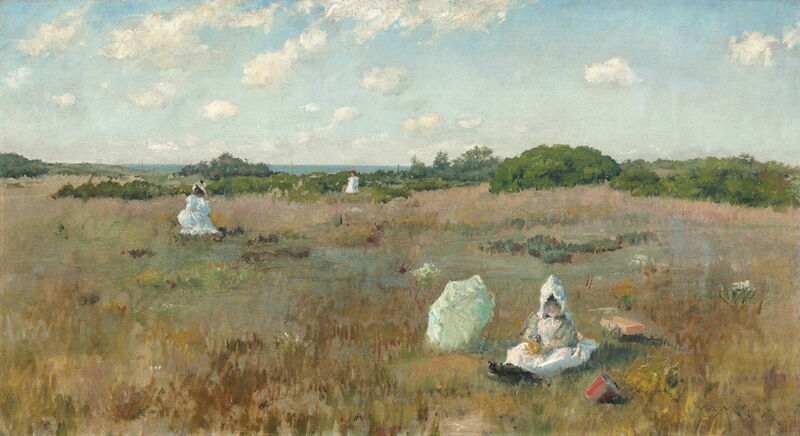 William Merritt Chase, Shinnecock Landscape with Figures (1895), oil on canvas, 148 x 211 cm, Private collection. 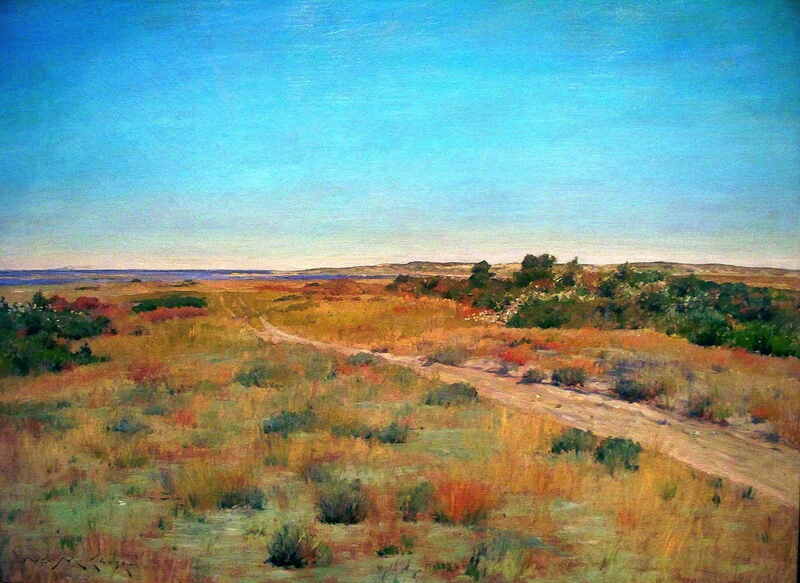 WikiArt. 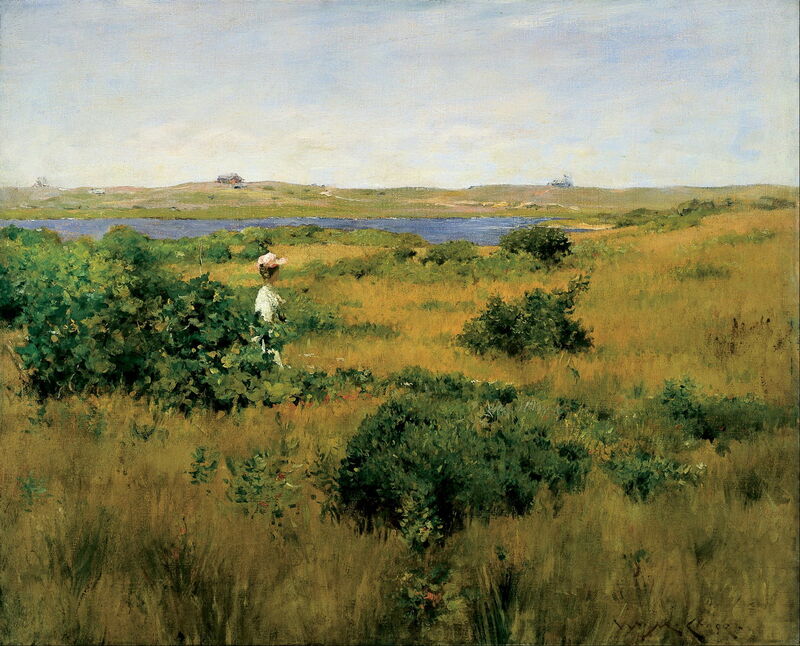 William Merritt Chase (1849–1916), Landscape: Shinnecock, Long Island (c 1896), oil on wood panel, dimensions not known, Princeton University Art Museum, Princeton, NJ. Wikimedia Commons. 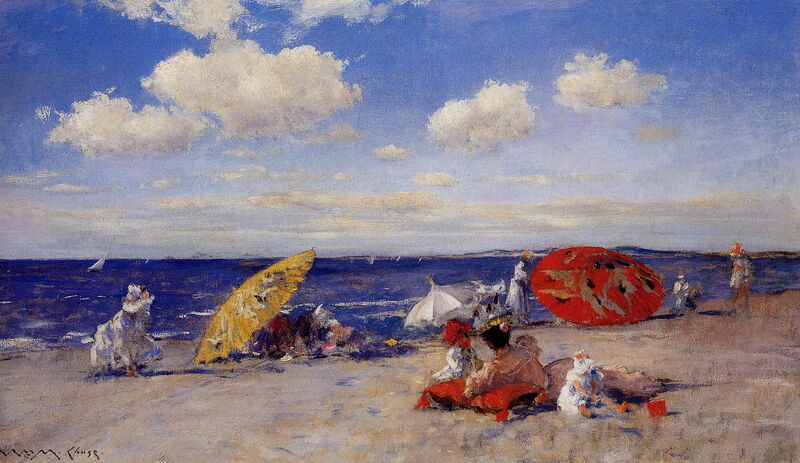 William Merritt Chase (1849–1916), Afternoon Shadows (c 1897), oil on panel, 36.8 x 40.6 cm, Private collection. Wikimedia Commons. 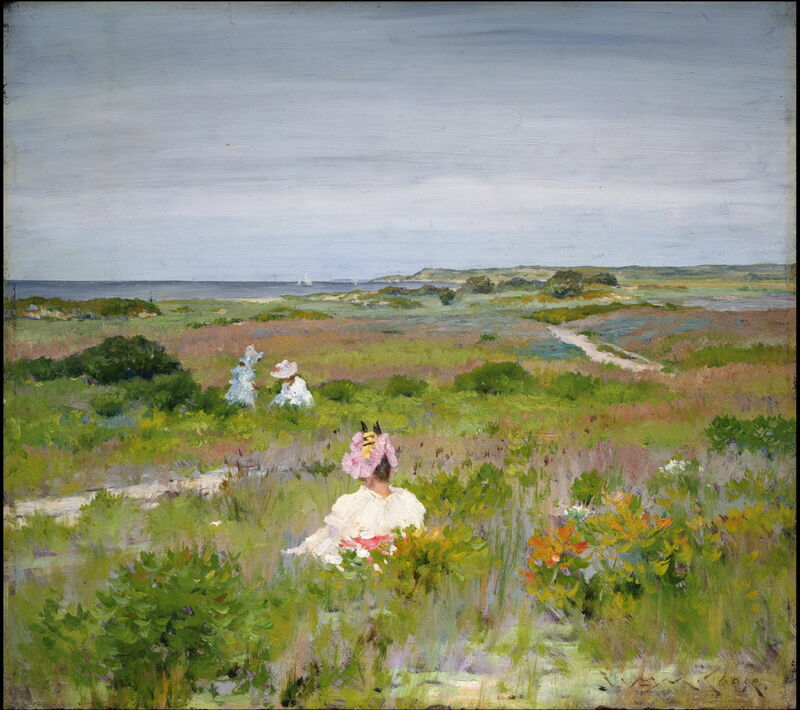 William Merritt Chase (1849–1916), Seaside Flowers (c 1897), oil on canvas, 73.7 × 97.8 cm, Crystal Bridges Museum of American Art, Bentonville, AR. Wikimedia Commons. 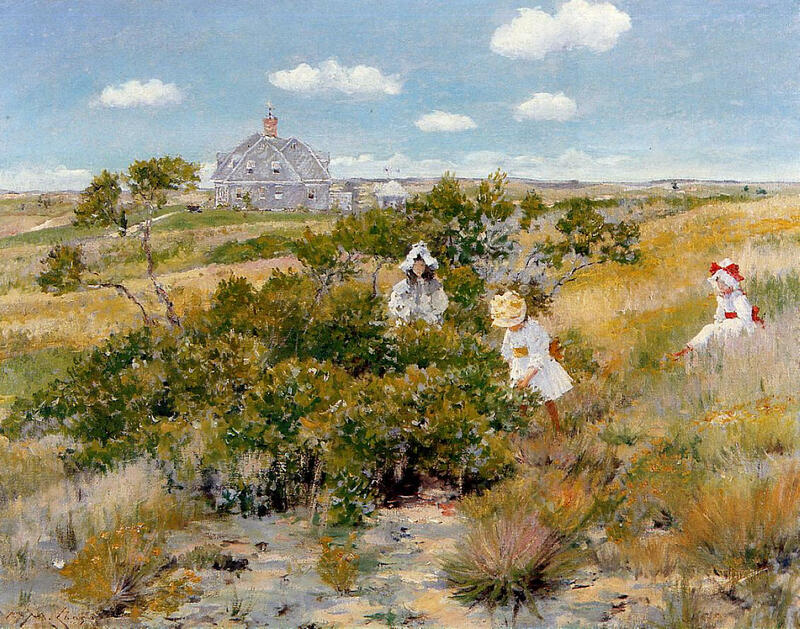 Note: I am not sure that An Afternoon Stroll (c 1895) was necessarily painted at Shinnecock, and am prepared to be corrected if I am wrong. However it does appear to belong in this series of his work. 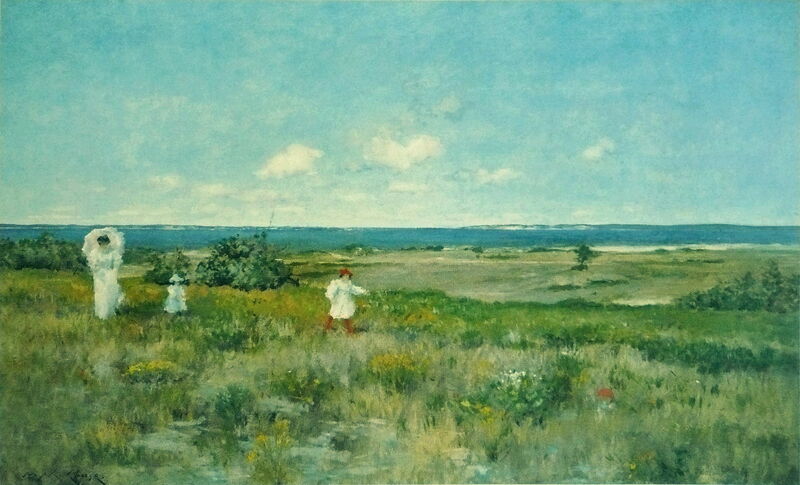 Posted in General, Painting and tagged Chase, Impressionism, landscape, Long Island, painting, Shinnecock. Bookmark the permalink.